This page contains pictures and information about Brown Small Milkweed Bugs that we found in the Brisbane area, Queensland, Australia. We notice them only after we carefully study the photos we took. Adult photos were taken in Macgregor Bushland. 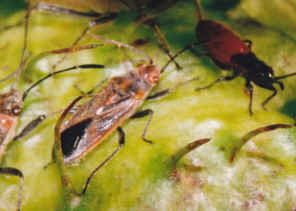 This Small Milkweed Bug has the orange-brown head and with pale brown pattern on thorax. 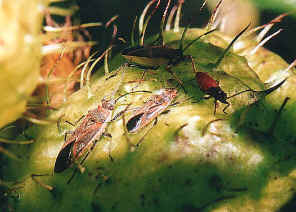 We found this bug feeding with different species of Milkweed Bug on seed pods. Please check this LYGAEINAE page for general infromation about Small Milkweed Bugs. 2. Arocatus continctus - Graeme's Insects of Townsville, Australia, 2010.